Epothilone B (BMS-247550) is a 16-membered polyketide macrolactone with a methylthiazole group connected to the macrocycle by an olefinic bond. The polyketide backbone was synthesized by type I polyketide synthase (PKS) and the thiazole ring was derived from a cysteine incorporated by a nonribosomal peptide synthetase (NRPS). In this biosythesis, both PKS and NRPS use carrier proteins, which have been post-translationally modified by phosphopantheteine groups, to join the growing chain. PKS uses coenzyme-A thioester to catalyze the reaction and modify the substrates by selectively reducing the β carbonyl to the hydroxyl (Ketoreductase, KR), the alkene (Dehydratase, DH), and the alkane (Enoyl Reductase, ER). PKS-I can also methylate the α carbon of the substrate. NRPS, on the other hand, uses amino acids activated on the enzyme as aminoacyl adenylates. Unlike PKS, epimerization, N-methylation, and heterocycle formation occurs in NRPS enzyme. Epothilone B starts with a 2-methyl-4-carboxythiazole starter unit, which was formed through the translational coupling between PKS, EPOS A (epoA) module, and NRPS, EPOS P(epoP) module. The EPOS A contains a modified β-ketoacyl-synthase (malonyl-ACP decarboxylase, KSQ), an acyltransferase (AT), an enoyl reductase (ER), and an acyl carrier protein domain (ACP). The EPOS P however, contains a heterocylization, an adenylation, an oxidase, and a thiolation domain. These domains are important because they are involved in the formation of the five-membered heterocyclic ring of the thiazole. EPOS P activates the cysteine and binds the activated cysteine as an aminoacyl-S-PCP. Once the cysteine has been bound, EPOS A loads an acetate unit onto the EPOS P complex, thus initiating the formation of the thiazoline ring by intramolecular cyclodehydration. Once the 2-methylthiazole ring has been made, it is then transferred to the PKS EPOS B (epoB), EPOS C (epoC), EPOS D (epoD), EPOS E (epoE), and EPOS F (epoF) for subsequent elongation and modification to generate the olefinic bond, the 16-membered ring, and the epoxide, as seen in Figure 5. One important thing to note is the synthesis of the gem-dimethyl unit in module 7. These two dimethyls were not synthesized by two successive C-methylations. Instead one of the methyl group was derived from the propionate extender unit, while the second methyl group was integrated by a C-methyl-transferase domain. Epothilone B could enhance the effects of radiation in human lung cancer cells both in vitro and in vivo and that a G2/M block and increased apoptosis might be possible explanations for the enhancement. 1. 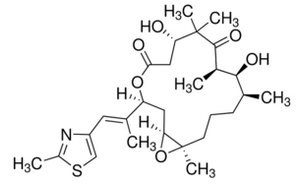 Schinzer, D. et al: "Total Synthesis of(−)-Epothilone B". Angew. Chem. Int. Ed. Engl. 36 (5): 523. (1997). 3. Höfle, G et al:. "Epothilone B and B—Novel 16-Membered Macrolides with Cytotoxic Activity: Isolation, Crystal Structure, and Conformation in Solution". Angew. Chem. 35 (1314): 1567 (1996). 4. Ilenia Pellicciotta et al: Gynecologic Oncology 122, 3(2011),625–631 "Epothilone B enhances Class I HLA and HLA-A2 surface molecule expression in ovarian cancer cells." 5. Jae-Chul Kim et al: Radiotherapy and Oncology 68, 3(2003),305–313 "Potential radiation-sensitizing effect of semisynthetic epothilone B in human lung cancer cells"